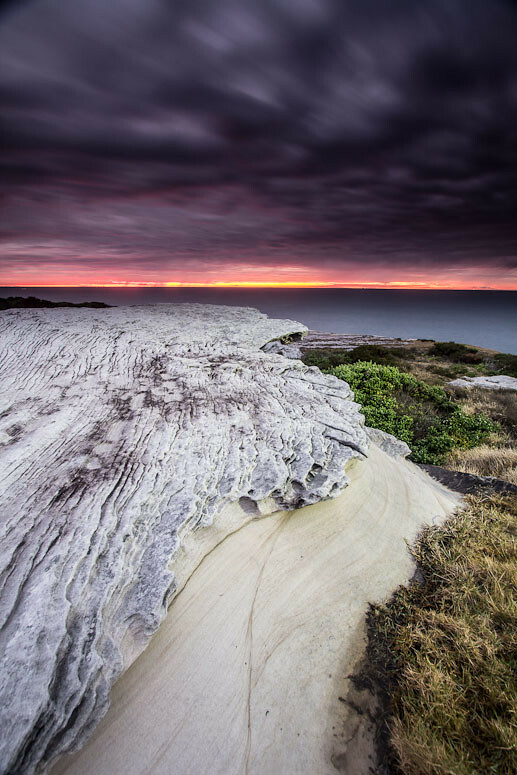 I have been meaning to get back to Botany Bay National Park for many years, i visited there yonks ago (before i was interested in taking pictures) and was amazed at the great cliffs. Hence I plan to do a sunrise there, conveniently enough the Flickr sunrise mob are also heading down that way but are going to Cape Solandar, however i am more interested in doing the little lighthouse which is set down on a little hill close to the cliffs. If any one else is keen drop me a PM or txt me. Its a bit hectic getting there and will involve quite a walk (think malabar style for those silly enough to have attended) in the dark, however you can keep your feet dry since its up on the cliff. Obviously there are a number of hazards, cliffs for one, no fences and a fairly rough walking track so take this into consideration. Saturday 16th is preferred, but could also do Sunday. Gerry, you will probably have to walk all the way from the front gate as I don't think NPWS open the gates until at least Sunrise. ATJ wrote: Gerry, you will probably have to walk all the way from the front gate as I don't think NPWS open the gates until at least Sunrise. intermittent rain forecast for tomorrow, could be really good or pretty crap.. I dunno Gerry. I think I am just hard to please. #2 the skies are just bleah. #4 they seem overcooked. Somewhere in between perhaps? Also I would like to see the trig station (?) cloned out. #3 I like as a record shot. Shame about the crack though. Perhaps you should talk to Leek about where he gets his models. His are certainly easier on the eye than yours. #1 nice sunrise. Maybe pushed a little too far into saturation. Or was it like that? I know they sometimes are. I was up at the other end of the night working on star trails, so I didn't see the sun come up. Mr Darcy wrote: I dunno Gerry. I think I am just hard to please. see the one in the 52 image thread, that was the sky about 5 minutes before that one was taken, the sky was dark and cloudy as shown then turned to a mild continuous grey. thats a lighthouse i could clone it out, but i reckon it does not draw that much attention atm anyway. Mr Darcy wrote: #3 I like as a record shot. Shame about the crack though. Perhaps you should talk to Leek about where he gets his models. His are certainly easier on the eye than yours. Mr Darcy wrote: #1 nice sunrise. Maybe pushed a little too far into saturation. Or was it like that? I know they sometimes are. I was up at the other end of the night working on star trails, so I didn't see the sun come up. yep, it was like that - the one with the cliff half red was like it as well, very little processing - just pure chance on how the sun rose and was blocked partially by the headland/clouds. this is what the predawn view looked like. and for kicks and giggles - later on on the walk back..
Wooo, he wouldn't want to hook a whale shark. Murray Foote wrote: Wooo, he wouldn't want to hook a whale shark. Had a good morning despite a little rain... A little more bush whacking under our belts.